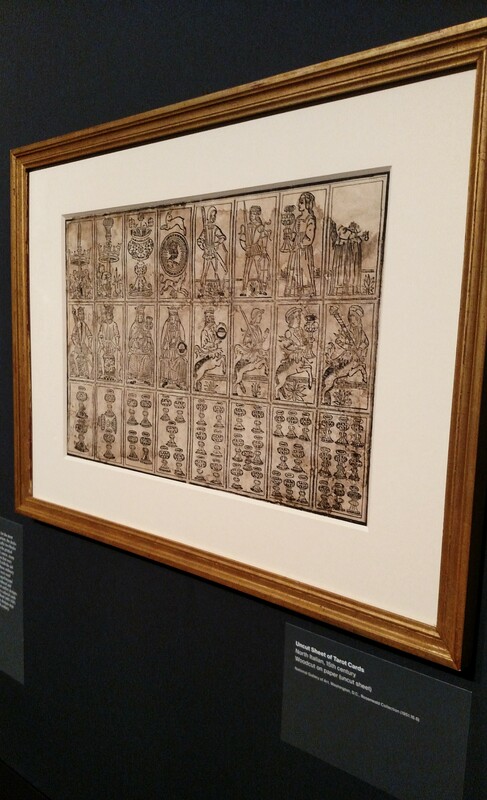 From January 20 to April 17 2016 The Cloisters, a branch of The Metropolitan Museum of Art, held an exhibit featuring playing cards from 1430 – 1540. … I had to go. 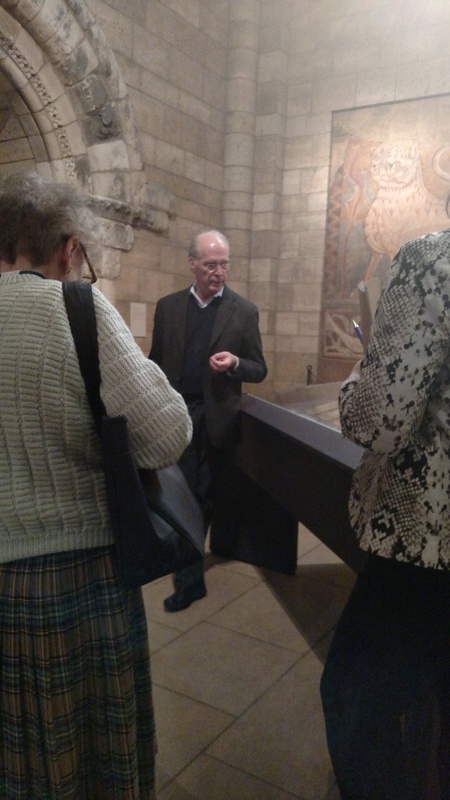 With great distance and my doubts weighing in, I contacted Tim Husband, the curator at The Cloisters. He is credited with the exhibit, as well as the catalogue, and the book that accompanies the Flemish Hunting Pack (the oval cards in their permanent collection) sold at their shop. He agreed to see me. we ventured off. My spouse provides good navigation in our travels, and eases my mind when I am doubtful. I was very nervous, and he could tell. After a few minutes, he confessed to me that there had been a double booking, and that a very small group was coming through to hear him lecture. I was invited to join them, and ask anything else afterwards. Yes please. The exhibit catalog is affordable, informative, and filled with beautiful HD images. 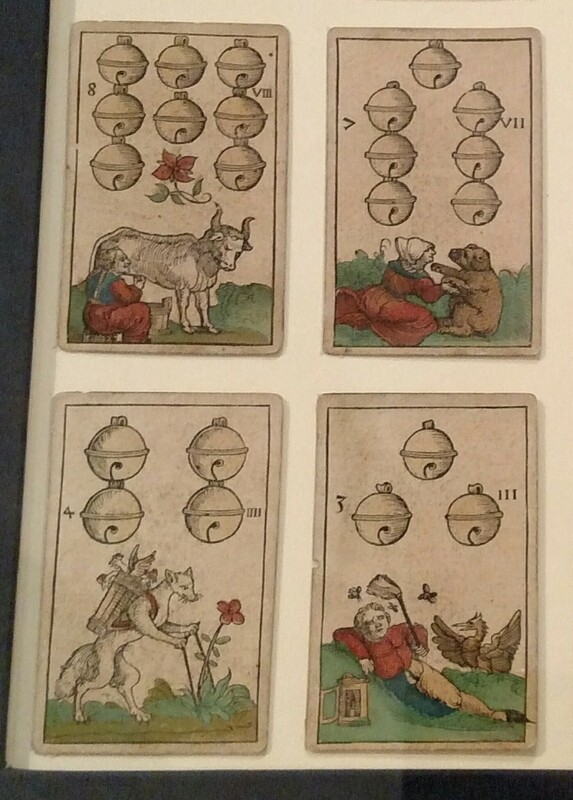 The reproductions of the Flemish Hunting Pack (oval cards) are full size with highly detailed images. They are wonderfully complete with the image of the back of the card matched to the correct front, but since this is where museum stamps are placed, the result is the pack being a “marked deck.” They are accompanied by what I first thought was just a booklet, but turned out to be a very thorough and focused book on these cards and the world that they were fabricated for. I went with questions about pigments and other materials, having found little data available about such. The reason, so often, involves a shortage of funds and interest. Many of these artifacts are not on display. 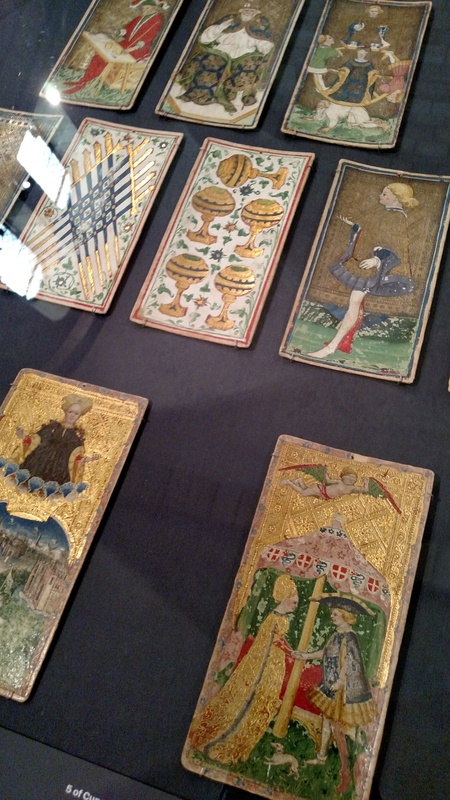 Even high profile artifacts, such as the Visconti tarots, are currently kept in storage. Worse yet, many specimens are kept in less than ideal archival conditions or are improperly mounted. There is still data, and with a shameless product promotion I found the exhibit book helpful with both its information and (very little!) lack thereof. Cards and packs of which details such as paper layering and pigment types are known mention them, while an absence means the data has not been collected. 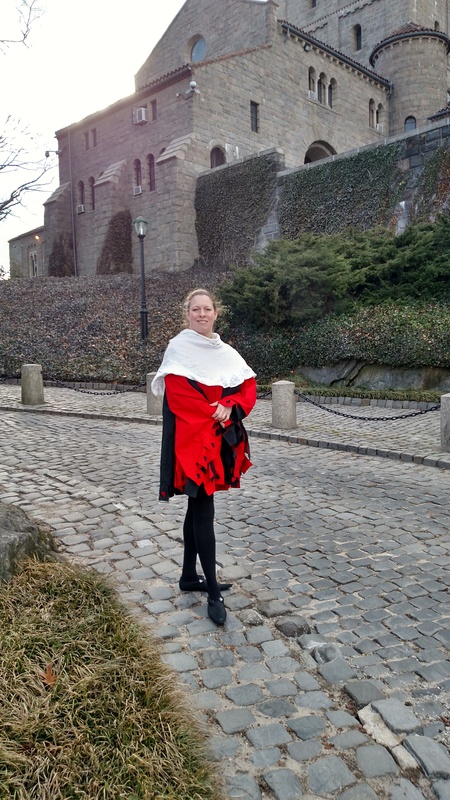 “Paper was not costly” – Tim Husband, explaining the availability and affordability of paper products in a world that still makes use of vellum. He proceeded to explain that paper wasn’t “cheap” either, but was very obtainable in this period. Said paper is how he confirmed dating on many of the artifacts, as many bear watermarks. Paper is also unique to each surviving pack. Mills began to appear in Europe by the mid 12th century, and by this era they are spread throughout. mills and crafters are competitive and even proprietary, so resulting construction methods do as well. Some of the large illuminated packs, for example, are made of as many as seven layers of paper, while others are made of simple card stock.